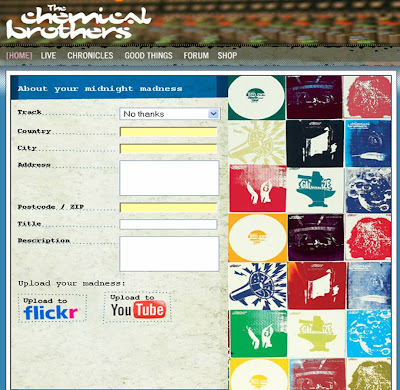 Chemical Brothers fans across the world are being encouraged to submit geotagged YouTube video clips or geotagged Flickr photographs through the Chemical Brothers website into Google Earth. A selection of the best content will be edited by Nexus into a Chemical Brothers concept video that will be available through a Google Earth channel and the Chemical Brothers YouTube channel - with all content used in the final Midnight Madness video tagged to the location that it was shot in. 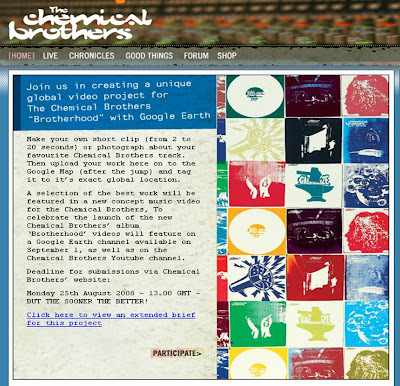 The Chemical Brothers are also allowing fans to use Google Earth to tag their location and their favourite Chemical Brothers track which will launch when the location is selected on Google Earth. 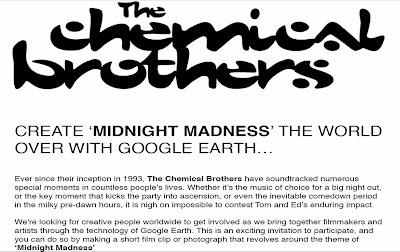 The Chemical Brothers Midnight Madness Google Earth project is the latest in a line of interesting initiatives by groups to promote their content. We have recently seen Radiohead produce a 3D data video for House Of Cards with Google and Coldplay using extensive viral activity to promote 'Viva La Vida or Death & All His Friends.' The Midnight Madness project is a clever way of bringing Google Earth to life for a global fan base and it will be interesting to see the end result!